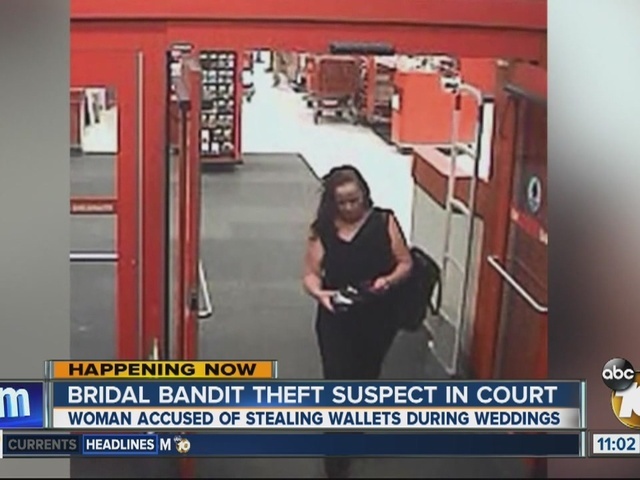 SAN DIEGO -- A woman accused of stealing wallets and credit cards from brides, bridesmaids and others during four recent weddings in San Diego pleaded not guilty Thursday to 25 charges, including burglary, grand theft and identity theft. Denise Gunderson -- who has been to prison seven times -- faces 19 years behind bars if convicted. Judge David Szumowski ordered the defendant held on $250,000 bail. Deputy District Attorney Brendan McHugh said Gunderson allegedly went into unsecured rooms and stole the wallets of people involved in the wedding, including wedding coordinators. "I haven't seen anything like it," the prosecutor said of the brazen crimes. "I'm sure it was terrible for them (the victims)." Gunderson, 50, was arrested Dec. 6 in Las Vegas, where she was arrested for allegedly stealing a wallet at a church, according to San Diego County sheriff's Detective Lisa Jenkins. Though Gunderson allegedly lied about her identity to Nevada authorities, detectives soon discovered that she was wanted on various theft charges in Southern California, Jenkins said. The charges in San Diego are the result of a joint investigation by the San Diego County Sheriff's Department, Riverside Sheriff's Department and the La Mesa Police Department, McHugh said. Gunderson will be back in court Jan. 12 for a readiness conference and Jan. 14 for a preliminary hearing.